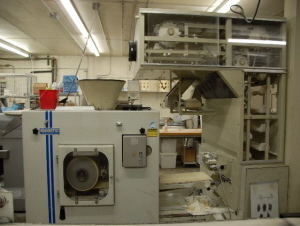 Adamatic Model ADR-2 Bread and Roll Line Rolls: Divides and Rounds 1 oz to 8.5 oz pieces up to 4,800 per hour. Breads: Divides and rounds 6 oz to 19 oz pieces up to 1,800 per hour. Design Features: New designed fully adjustable hydraulic main piston drive which assures extremely accurate scaling and minimum dough punishment. Uniform, smooth variable speed rouonding Adjustable gravity feed oiling system Oversized sealed hevay duty bearings Heavy weight DACRON discharge belt Reinvorced fiberglass covers. . all electrically ihterlocked for safety BISSC approved sanitary design. Plexiglass inspection windows Continuous hopper feeding Simple weight adjustment Easy to keep clean and maintain Standard eequiment includes one rounding drum and one scaling die. Electrical: 208/220V, 3 PH 60 HZ Line comes with 4 drums ** Machine will be brought into our shop and refurbished before delivering to the cusotmer, allow 3 weeks lead time for this to happen.